WHAT USES DOES D1 USE CLASS COVER? 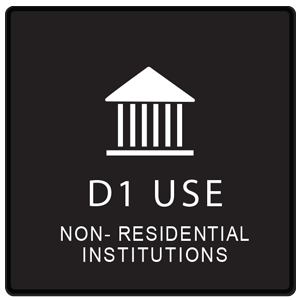 D1 Use Class covers the following uses: Clinics, health centres, crèches, day nurseries, day centres, schools, art galleries (although not to hire or sell), museums, libraries, village halls, places of worship, church halls, law courts. Non-residential education centres or training centres. As well as Planning Use Class D1, you can see a comprehensive list of the use classes order for other Planning use classes, see the link on the planning portal. In the event of ambiguity, it may be an idea to check and confirm your use class with your local planning authority (LPA), as their advice will take precedence over the Planning Portal. Incidentally, an acupuncture clinic comes under D1 because it is health-related, whereas a nail bar is Sui Generis (beauty related, not health), but a hairdresser (surprisingly) is A1 – retail. Note also a nail bar which sells items to take off the premises would be considered partly a shop and therefore it would be Mixed Use: Sui Generis & A1. Hair dressers also sell products to take away – but they are already considered A1 – so not a Mixed Use. We a client last year who was the lead practitioner in a large GP’s surgery in Croydon (which comes under D1 use class). The location was very central and he wanted to improve access for his patients by providing a disabled lift at the front of the building. It was to be situated in the place of the existing porch / veranda, which was a semi-closed structure. As well as the lift, he wanted to create a space for parents to leave their buggies, thus alleviating their previous spatial issue of congestion in the reception area. It has close walking access to tram links (2 minutes) and East Croydon station (5 minutes) and bus stops on the same road. The premises is very sizeable as it is comprised of 4 houses (2 sets of semi-detached) with a covered walkway adjoining them. Previous planning applications were for a change of use from C3 residential to D1 planning use for a medical clinic, the addition of a small car park for patients (existing parking reserved for doctors), front and rear extensions, roof alterations and extensions to install 5 dormers for clinical use. Later applications for additional rear extensions and parking spaces were refused, which is why we recommended the Feasibility Study to avoid another refusal. However, they were granted a first floor extension above their single storey rear extension and space for motor bikes and bicycles. We created planning drawings and then building regulations drawings for him, once the approval was given. We did not use the pre-planning application route as it is not a conservation area, however we did commission a Feasibility Study to support the planning application. The planning approval was partly aided by the fact that front extensions (normally fairly contentious), are quite prevalent on that road. We had to come up with a roof design which was not too bulky, partly because it is a corner plot. Also advantageous to the application was the space that was left between the new side perimeter and the pavement boundary, thus the structure was not overbearing to passers-by. The feasibility study showed 2 design options, giving the planning officers the chance to express a preference between the options. The smaller extension proposal allows for a ramp, although for the lift to be accommodated, some reconfiguration of the stairwell and adjacent wall may likely be required. The larger extension would not impose on the existing building in this way, and also creates the visual interest of a stepped feature which is also featured elsewhere on the same road. The addition of a disabled lift was very positive as it matches the London Plan, with regards to the rising elder population. The lift can accommodate mobility scooters and makes flow of movement in the clinic a lot easier for disabled users, without causing disruption to non-disabled users and staff. In addition the lift will be low-noise, and so will avoid disturbing local residents. The works are set to commence in the New Year. For other commercial projects have a look at our news or projects pages.